Knox Opticians can treat a variety of eye problems at our Muirend and Strathaven practices including Conjunctivitis, Eye infections and General eye pain. Knox Opticians are able to clinically assess a patient, establish a diagnosis, determine the clinical management required and prescribe a course of treatment where necessary. If you have an eye problem, simply contact Knox Opticians for a free eye assessment. In the majority of cases, this can be quicker than waiting for an appointment with your GP. 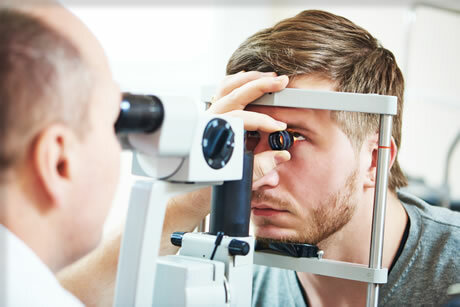 You will receive the same type of eye examination offered by an optometrist in the hospital, and we can usually prescribe a course of treatment. If there is a more serious problem, you will be referred to a specialist at the eye hospital. • Corneal abrasions (Scratched eye). • Conjunctivitis (pink eye). • Dry eye syndrome. • Eye allergies. • Eye floaters, flashes & spots. • Inflamed eyes & eye infections. • Keratitis (Inflamed Cornea). • Iritis. • General eye pain or discomfort. • If you have a problem with your eyes visit your local Optometrist (Optician). • If your optician is closed please contact NHS 24 for advice (telephone 111). • If you have an eye injury that requires immediate emergency treatment go to the nearest Accident and Emergency (A&E) Department. • If your eye problem requires treatment by an Eye Doctor (Ophthalmologist) your optometrist can refer you to your local hospital. Your GP and local A&E can also do this. • If this problem is urgent you may be referred to the new Glasgow Ophthalmology Acute Referral Centre (ARC) at Gartnavel General Hospital. • If you are already attending an eye clinic and have an issue regarding your condition, make your consultant’s secretary at the hospital your first call. 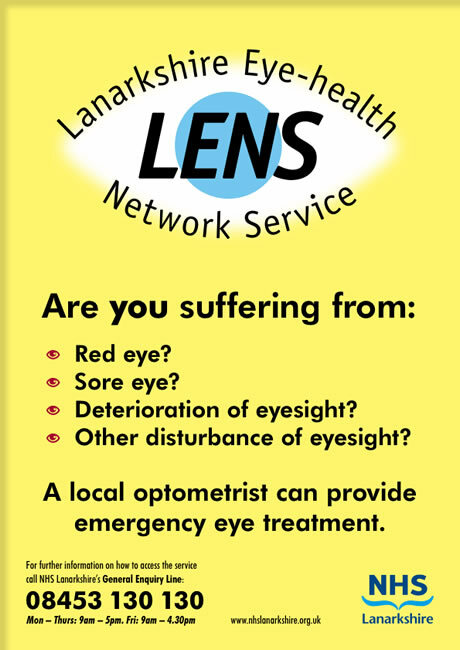 Our Strathaven practice is a member of the LENS scheme and our local optometrists can provide emergency eye treatment. Children with eye problems should attend their GP during working hours or contact NHS 24 if the GP surgery is closed. Eye emergencies or injuries should attend their local A&E department or the Royal Hospital for Sick Children (Yorkhill).